LaShawn Fowler had an interesting introduction to the world of HIV. "I was diagnosed positive for HIV in 1995," LaShawn said. "The physician told me verbally that I was HIV-positive, but he gave me a sheet of paper that said I tested negative. I didn't agree with what the doctor said - I didn't believe I was HIV-positive." LaShawn was tested again in 1998, and this time the test result was clearly positive. But again, LaShawn chose to ignore it. "I was in denial," LaShawn said. "The words went in one ear and out the other. I knew about people getting HIV and getting sick and dying, but I just didn't see that happening to me. I told my father about the diagnosis, and he said, 'There's nothing wrong with you, that's just something they're telling you.' I told him, 'I agree with you.' It wasn't until a couple years later, when I became an HIV educator and started taking meds, that I really accepted my status." In 2001, LaShawn was hired by Detroit Community Health Connection, a non-profit community clinic. He took his certification as an HIV educator in 2001, renewed it in 2002, and then renewed it again in 2007. 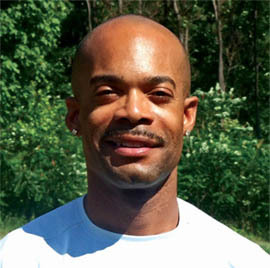 His work as an HIV educator naturally led to disclosing his status. "I started by disclosing my status to my clients, then to groups I addressed as an HIV speaker," LaShawn said. "That gave me the courage to say, 'This is who I am. Either you accept it, or you don't." LaShawn says he never has had a negative response from anyone he has told about his HIV status. But he has HIV-positive friends who are very uncomfortable about disclosing. "On the one hand, I understand it, because not everyone reacts in the same way," LaShawn said. "On the other hand, I get upset, because one of the reasons this disease is still spreading is because of people who don't disclose." LaShawn channeled his feelings into a book he wrote, titled "How to Share your HIV Diagnosis with Family, Friends and Sexual Partners." The book is available on-line at: How to Share Your HIV Diagnosis With Family, Friends and Sexual Partners. "Writing my book took just about 3 1/2 years," LaShawn said. "It was excellent therapy, but it was also frustrating to edit. I didn't want to just ramble on about being HIV-positive. I wanted to give people something that would be thought-provoking, entertaining, educational and helpful." We asked LaShawn what advice he would give to someone newly diagnosed with HIV. "I'm very encouraging to people I meet who are newly diagnosed," LaShawn said. "People think they're going to die, but, of course, that's not true. I tell them to keep living their life as they were before - except that, if they're using drugs or alcohol, they should really try to quit." "I also suggest that they do the same thing anyone does who wants to be healthy. Take your vitamins. Eat a healthier diet, with more fruits and vegetables. Watch your stress level. Get some exercise." "Also, have some kind of communication outlet," LaShawn said. "It can be on-line or in-person, but you need to have someone you can talk to."